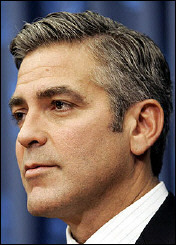 Washington: If openly airing his opposition to the US-led Iraq invasion makes George Clooney a ¡®traitor¡¯, then the actor doesn¡¯t mind living with the tag. Clooney, an outspoken critic of the war, revealed that he had been labeled a ¡®traitor¡¯ by a magazine in the months before American forces invaded Iraq. However, the Hollywood hunk insists he would rather live with being called a turncoat, rather than not taking a stance. "During the lead-up to the Iraq war I was on the front of a magazine and called a traitor. I ran into a guy not long ago who said, 'Why do you hate your country?' I said, 'Because I thought we should ask questions before we sent 150,000 people in'". Clooney admits that he knows that he will be slammed for some of the comments he makes, especially since he happens to be famous.